This fact sheet reviews definitions of homelessness and describes the demographic characteristics of persons who experience homelessness. A list of resources for further study is also provided. The education subtitle of the McKinney-Vento Act includes a more comprehensive definition of homelessness. This statute states that the term ‘homeless child and youth’ (A) means individuals who lack a fixed, regular, and adequate nighttime residence… and (B) includes: (i) children and youth who lack a fixed, regular, and adequate nighttime residence, and includes children and youth who are sharing the housing of other persons due to loss of housing, economic hardship, or a similar reason; are living in motels, hotels, trailer parks, or camping grounds due to lack of alternative adequate accommodations; are living in emergency or transitional shelters; are abandoned in hospitals; or are awaiting foster care placement; (ii) children and youth who have a primary nighttime residence that is a private or public place not designed for or ordinarily used as a regular sleeping accommodation for human beings… (iii) children and youth who are living in cars, parks, public spaces, abandoned buildings, substandard housing, bus or train stations, or similar settings, and (iv) migratory children…who qualify as homeless for the purposes of this subtitle because the children are living in circumstances described in clauses (i) through (iii). McKinney-Vento Act sec. 725(2); 42 U.S.C. 11435(2). Other federal agencies, such as the Department of Housing and Urban Development (HUD), interpret the McKinney-Vento definition to include only those persons who are on the streets or in shelters and persons who face imminent eviction (within a week) from a private dwelling or institution and who have no subsequent residence or resources to obtain housing. This interpretation of homelessness serves large, urban communities where tens of thousands of people are literally homeless. However, it may prove problematic for those persons who are homeless in areas of the country, such as rural areas, where there are few shelters. People experiencing homelessness in these areas are less likely to live on the street or in a shelter, and more likely to live with relatives in overcrowded or substandard housing (U.S. Department of Agriculture, 1996). Two trends are largely responsible for the rise in homelessness over the past 20-25 years: a growing shortage of affordable rental housing and a simultaneous increase in poverty. Persons living in poverty are most at risk of becoming homeless, and demographic groups who are more likely to experience poverty are also more likely to experience homelessness. Recent demographic statistics are summarized below. In 2003, children under the age of 18 accounted for 39% of the homeless population; 42% of these children were under the age of five (National Law Center on Homelessness and Poverty, 2004). This same study found that unaccompanied minors comprised 5% of the urban homeless population. However, in other cities and especially in rural areas, the numbers of children experiencing homelessness are much higher. According to the National Law Center on Homelessness and Poverty, in 2004, 25% of homeless were ages 25 to 34; the same study found percentages of homeless persons aged 55 to 64 at 6%. Most studies show that single homeless adults are more likely to be male than female. In 2007, a survey by the U.S. Conference of Mayors found that of the population surveyed 35% of the homeless people who are members of households with children are male while 65% of these people are females. However, 67.5% of the single homeless population is male, and it is this single population that makes up 76% of the homeless populations surveyed (U.S. Conference of Mayors, 2007). As the number of families experiencing homelessness rises and the number of affordable housing units shrinks, families are subject to much longer stays in the shelter system. For instance, in the mid-1990s in New York, families stayed in a shelter an average of five months before moving on to permanent housing. Today, the average stay is 5.7 months, and some surveys say the average is closer to a year (U. S. Conference of Mayors, 2007 and Santos, 2002). For more information, see our fact sheet on Homeless Families with Children. In its 2006 survey of 25 cities, the U.S. Conference of Mayor found that the sheltered homeless population is estimated to be 42 percent African-American, 38 percent white, 20 percent Hispanic, 4 percent Native American and 2 percent Asian. (U.S. Conference of Mayors, 2006). Like the total U.S. population, the ethnic makeup of homeless populations varies according to geographic location. For example, people experiencing homelessness in rural areas are much more likely to be white; homelessness among Native Americans and migrant workers is also largely a rural phenomenon (U.S. Department of Agriculture, 1996). Battered women who live in poverty are often forced to choose between abusive relationships and homelessness. In a study of 777 homeless parents (the majority of whom were mothers) in ten U.S. cities, 22% said they had left their last place of residence because of domestic violence (Homes for the Homeless, 1998). A 2003 survey of 100 homeless mothers in 10 locations around the country found that 25% of the women had been physically abused in the last year (American Civil Liberties Union, 2004). In addition, 50% of the 24 cities surveyed by the U.S. Conference of Mayors identified domestic violence as a primary cause of homelessness (U.S. Conference of Mayors, 2005). Studying the entire country, though, reveals that the problem is even more serious. Nationally, approximately half of all women and children experiencing homelessness are fleeing domestic violence (Zorza, 1991; National Coalition Against Domestic Violence, 2001). For more information, see our fact sheet on Domestic Violence and Homelessness. Twenty two cities reported that, on average, 15 percent of homeless persons were victims of domestic violence (U.S. Conference of Mayors 2008). Research indicates that 40% of homeless men have served in the armed forces, as compared to 34% of the general adult population (Rosenheck et al., 1996). In 2005, the U.S. Conference of Mayors’ survey of 24 American cities found that 11% of the homeless population were veterans – however, this does not take gender into account (U.S. Conference of Mayors, 2005). The National Coalition for Homeless Veterans estimates that on any given night, 271,000 veterans are homeless (National Coalition for Homeless Veterans, 1994). For more information, see our fact sheet on Homeless Veterans. The 24 cities providing this information estimated that 13 percent of persons experiencing homelessness were veterans. Veterans are slightly over-represented among the homeless population compared to their prevalence in the overall population (11.2 percent) (U.S. Conference of Mayors 2008). Persons with severe mental illness represented about 26 percent of all sheltered homeless persons (Annual Homeless Assessment Report to Congress, 2008). According to the Federal Task Force on Homelessness and Severe Mental Illness, only 5-7% of homeless persons with mental illness require institutionalization; most can live in the community with the appropriate supportive housing options (Federal Task Force on Homelessness and Severe Mental Illness, 1992). For more information, see our fact sheet on Mental Illness and Homelessness. The 23 cities that provided information reported that 26 percent of their homeless population suffered from a serious mental illness. By contrast, only six percent of the U.S. population suffers from a serious mental illness (U.S. Conference of Mayors 2008). Surveys of homeless populations conducted during the 1980s found consistently high rates of addiction, particularly among single men; however, recent research has called the results of those studies into question (Koegel et al., 1996). In Summary, the studies that produced high prevalence rates greatly over represented long-term shelter users and single men, and used lifetime rather than current measures of addiction. While there is no generally accepted “magic number” with respect to the prevalence of addiction disorders among homeless adults, the U.S. Conference of Mayors’ number in 2005 was 30%, and the frequently cited figure of about 65% is probably at least double the real rate for current addiction disorders among all single adults who are homeless in a year. Among surveyed homeless people 38% have an alcohol problem, and 26% report problems with other drugs (National Health Care for the Homeless Council). For more information, see our fact sheet on Addiction Disorders and Homelessness. Declining wages have put housing out of reach for many workers: in every state, more than the minimum wage is required to afford a one- or two-bedroom apartment at Fair Market Rent.1 (National Low Income Housing Coalition, 2001). In fact, in the median state a minimum-wage worker would have to work 89 hours each week to afford a two-bedroom apartment at 30% of his or her income, which is the federal definition of affordable housing (National Low Income Housing Coalition 2001). Thus, inadequate income leaves many people homeless. The U.S. Conference of Mayors’ 2005 survey of 24 American cities found that 13% of the urban homeless population were employed (U.S. Conference of Mayors, 2005), though recent surveys by the U.S. Conference of Mayors have reported as high as 25%. In a number of cities not surveyed by the U.S. Conference of Mayors – as well as in many states – the percentage is even higher (National Coalition for the Homeless, 1997). When asked to identify the three main causes of hunger in their city, 83 percent of cities cited poverty, 74 percent cited unemployment and 57 percent cited the high cost of housing. (U.S. Conference of Mayors 2008). For more information, see our factsheets on Employment and Homelessness and Why Are People Homeless?. As this fact sheet makes clear, people who become homeless do not fit one general description. However, people experiencing homelessness do have certain shared basic needs, including affordable housing, adequate incomes, and health care. Some homeless people may need additional services such as mental health or drug treatment in order to remain securely housed. All of these needs must be met to prevent and to end homelessness. How many people are homeless? Families with children are now the fastest growing group of the homeless population, they account for about 40% of the people who become homeless each year. 38% of the people already homeless are families with children. 50% of America’s homeless women and children are running from domestic abuse. Veterans – Of all homeless men 40% of them have served in the armed forces. Only 34% of the total adult male population has served in the armed forces 19% of the urban homeless population are veterans. Mental Illness – 20-25% of the single adult homeless population mentally ill. Only 5-7% of the mentally ill homeless need to be institutionalized. The entire homeless population does not fit one description although, they do have shared needs. These need include affordable housing, adequate income and health care, some need psychological help and drug treatment. Most of all they need the help of those around them who are stable and fortunate enough to help. In 1996, the U.S. Conference of Mayors’ took a survey of homelessness in twenty-nine cities. The results showed that children under the age of eighteen were 27% of the urban homeless population. 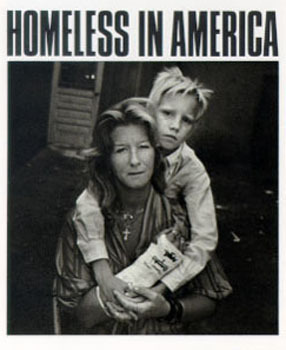 In 1987, the Urban Institute found that 51% of the homeless population were from thirty-five to fifty years old. Percentages of homeless people from fifty-five to sixty years old were 2.5% to 19.4%. The Conference of Mayors’ in 1996, found that single men and women make up 45% and 14% of the homeless population, respectively.